The original Thunderstruck video slot is an absolute classic of the online gaming realm, but the sequel is bigger and better just about every way. Let us walk you through the myriad bonus features that make this Norse-themed thriller one of the best slots in the entire Microgaming catalogue. If you are ready to dive in right away and discover for yourself the magic of the Thunderstruck II online slot game, we highly recommend the safe real money casino sites in the table above. Each of these trusted operators offers hundreds of Microgaming slot titles for cash betting on desktop, tablet and smartphone devices, as well as the option to play for fun with no money required. We at RMC only feature slot sites that are licensed, regulated and SSL protected. Follow the links above to sign up and enjoy some of the web’s best online casino bonuses. 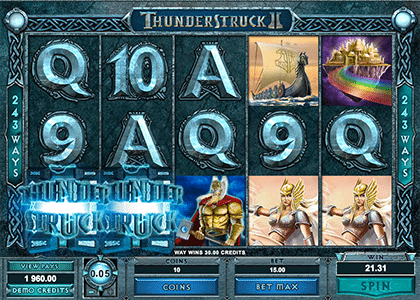 The Thunderstruck II video slot features five reels, three rows of symbols and 243 ways to win. You can choose from 10 bet levels and four coin denominations (0.01, 0.02, 0.05 and 0.10). The minimum bet is $0.30 per spin, made by playing a 0.01 coin on the first bet level, while the $30 max bet is achieved by selecting the largest coin size (0.10) and highest number of coins per spin (10). 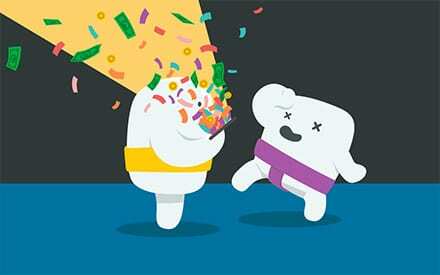 The game has 12 standard symbols, divided evenly into high-paying characters and lower-paying royals. Below are the coin returns for each symbol type, ranked from highest (five symbols) to lowest (three symbols). While the Thunderstruck II slot does not have any progressive jackpots, it does have a maximum payout of some 2,400,000 coins. The game also comes with a Paytable Achievements feature that turns completed combinations gold so you can keep track of your progress. The title logo can substitute for any symbol (except the scatter) in order to create or extend a paying combo. This is a classic wild multiplier feature, meaning it also doubles any line wins when part of a paying combination. The scatter feature can appear on all five reels. It wins from any position (i.e. you don’t need a standard left-to-right combination) and pays according to the total amount staked. Even better, you only need two scatters to win. The Thunderstruck II real money slot game’s standout feature is the Great Hall of Spins, which opens its doors every time you hit three or more scatters on the same spin. 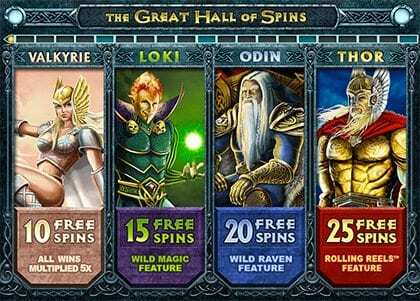 There are four free spins features in total, each of which corresponds to a well-known character or creature of Norse mythology. The only way to unlock all bonus games and the special features therein is to gain repeat entries into the Great Hall. Not only do the winged handmaids of Odin carry brave warriors from the field of battle to the halls of Valhalla, they also award 10 retriggerable free spins with a fixed 5x multiplier. The Valkyrie bonus is available at any time. Along with 15 free spins, the flame-browed villain of Asgard has a Wild Magic trick up his sleeve that turns standard symbols into substitutes at random. The Loki bonus is only available once the Great Hall is opened five times. The wise old wanderer offers 20 free spins and a Wild Raven bonus that turns random symbols into double and triple multipliers. If both birds land on the reels, a whopping 6x multiplier may appear. The Odin bonus is only available from the 10th entry into the Great Hall. Progress all the way to Asgard’s hammer-wielding maker of maelstroms to score 25 free spins with Microgaming’s Rolling Reels feature, which awards up to a 5x multiplier for consecutive wins. The Thor bonus round is only available from the 15th trigger of the Great Hall of Spins. As one of the most popular online slot games in the Microgaming collection, Thunderstruck II is a staple title at the best mobile casinos. 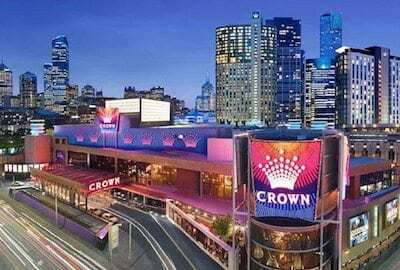 Whether you use Apple or Android, tablet or smartphone, you can journey to the Great Hall of Spins and beyond by signing up at our top-ranked Microgaming casinos via Chrome, Firefox, Safari, or any other HTML5-capable web browser. All games are optimised for instant play with no downloads and feature intuitive touch interfaces so you can spin the reels, adjust your bets and navigate your way around the casino lobby with ease. Much like the ongoing mainstream appeal of its subject matter, the Thunderstruck II online video pokie is one of those games that will stand the test of time. Bold animations and a well-matched soundtrack might lure you in, but it’s the superb gameplay features that keep you spinning. Too many new slot releases are missing a wild multiplier, so that’s a big win straight off the bat. This a medium variance pokie by nature, but the option to choose between low and high volatility features in the Great Hall of Spins is a really nice touch. The only thing we can fault is the relative lack of betting options. Whereas many modern video slots offer a wide range of coin sizes and accept bets as high as $200 per spin, Thunderstruck II is at the lower end of punting spectrum with a $0.30-$30 bet limit. That’s plenty rich for most folks’ blood, but the real high rollers might want a bit more room to manoeuvre. Click here to read more RMC reviews of top online slots by Microgaming, Net Entertainment, Betsoft, Play’n Go, Yggdrasil and many more of the web’s leading casino software developers.